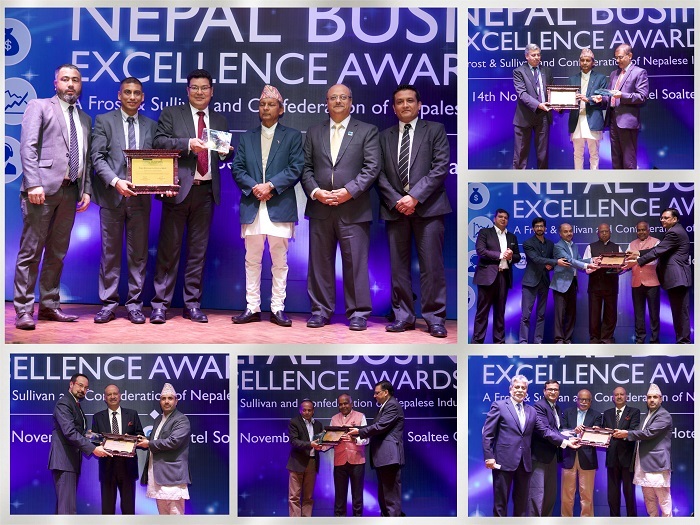 Frost & Sullivan and Confederation of Nepalese Industries (CNI) concluded the first edition of 2017 Nepal Business Excellence Awards (NBEA) on November 14th at Hotel Soaltee Crowne Plaza, Kathmandu, Nepal. The highly coveted and sought-after awards program honored companies delivering exceptional performances across industries. This year, Excellence Awards were presented to 11 companies in four major categories: Emerging Business, Medium Business, Large Business and Mega Large Business. Sipradi Trading Pvt. Limited was recognized with the “Super Platinum Award” and Nepal SBI Bank Limited was declared the “Super Platinum Award – 1st Runner Up”. The event had more than 120 industry leaders in attendance. The participating companies for 2017 Nepal Business Excellence Awards were from verticals such as Manufacturing, Trading, IT&ITES, BPO/KPO, Hospitals, Construction, Logistics, Hotels, Banking and Financial Services & Insurance. The awards banquet commenced with CNI President, Hari Bhakta Sharma delivering the inaugural address on “Business Excellence in Nepal” talking about how this opportunity was missing for a long time. “This is to honor people who have exhibited excellence and whose practices, we can learn from,” he said. Highlighting the “Significance of Business Excellence” during the welcome note, Aroop Zutshi, Global President & Managing Partner, Frost & Sullivan said, “CEOs these days are more concerned about the pace of change driven by technology, and are changing the way companies compete.” He further applauded all the potential leaders and disruptors of Nepal, who have shown significant growth in the past few years. The awards program also showcased an interactive panel discussion titled “Nepalese companies will be globally competitive by 2022 – A utopic assumption or a possible reality?” where industry experts deliberated on readiness of Nepalese industries to adopt global best practices and how they will fare in the next five years. The panel shared their insights on the current challenges being faced by business owners and how the government could aid them to make the environment more conducive. The panel also discussed initiatives that can be taken by government bodies to support the domestic market compete globally and set a benchmark for themselves in future. The discussion ended on an optimistic note highlighting the potential of Nepalese companies to meet international standards, if it gears up immediately. Frost & Sullivan’s rigorous measurement-based methodology and parameters for the awards are aimed at selecting the best-in-class. The assessment process involved participation from Frost & Sullivan and CNI industry experts. Acknowledging the stellar achievements of the participating companies, CNI spokesperson said that it is important to understand how businesses match the expectations of the global marketplace. At the concluding session, Mangesh Lal Shreshtha, Managing Director, Frost & Sullivan – Nepal, discussed and applauded the accomplishments of the companies and front-runners in the areas of innovation, convergent thinking and advanced technologies that are catalyzing and transforming industries in Nepal. To know more about the 2017 awards, please log onto www.frost.com/2017nbea. To participate in the 2018 edition, please reach out to Ms. Iru Shrestha, Frost & Sullivan at iru.shrestha@frost.com and Mr. Shanker Man Singh, Confederation of Nepalese Industries, at shankerman.singh@cnind.org with your full name, company name, title, telephone number and company e-mail address. The apex body of Nepalese industrialists, the Confederation of Nepalese Industries (CNI), was established by the captains of Nepal’s Industrial and corporate sector on April 17, 2002. Since its establishment, CNI has been raising issues like the persistent economic situation imbroglio, need for reforms in the financial sector, strengthening of private sector’s capabilities, the streamlining of private sector’s initiation on development agenda, double-digit growth issues and industrialization based on trade competitiveness. It is an organization that works in coordination with other organizations and is increasingly becoming involved in areas where the existing system has failed to deliver. The organization is working along the lines of several organizations in various developing countries such as India, Japan, Thailand, Malaysia, etc. and hopes to hire expertise as well as bilateral support in development of the Confederation, the theme of which is, “Talking Business, Talking Change”.